Possibly in the collection of John Crichton-Stuart, 4th Marquess of Bute (1881-1947; by descent to John Crichton-Stuart, 6th Marquess of Bute (1923-1993). London, sale, Bonham’s, December 12, 2001, lot 349: “Follower of Jean-Antoine Watteau, 18th Century / Blind Man’s Buff / bears signature ‘A. 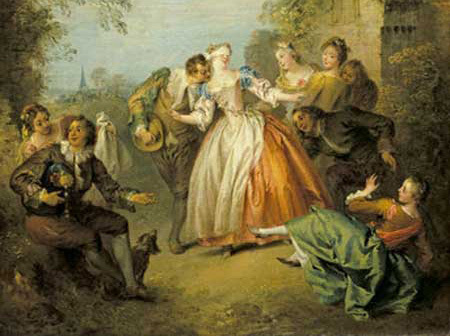 WATTEAU’ / oil on canvas / 29 x 49 in. (73.7 x 124.5 cm) / £7,000-10,000 / US $9,800-14,000 / PROVENANCE: Believed to have been acquired by John, 4th Marquess of Bute; The Trustees of the Residu Funds of the 4th Marquess of Bute.“ Sold for £7,000. Despite the presence of a supposed signature of “A. 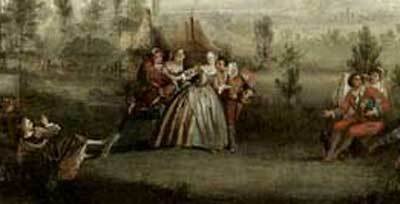 Watteau,” this picture could never have been painted by him. 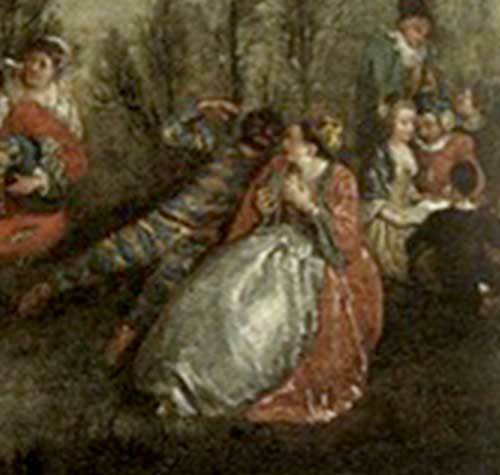 Not only did Watteau never sign a painting, but it is grossly inferior to works by Watteau and his contemporaries. 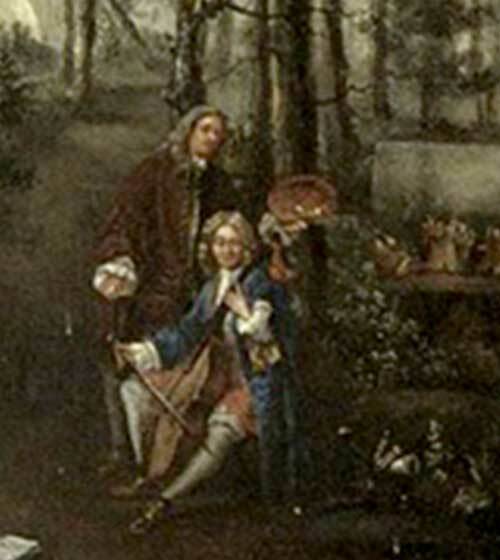 In fact, the whole of the painting is derivative; it is merely a compilation of figures from several sources within Watteau’s oeuvre and also borrows from Pater. Anonymous artist, Blind Man’s Buff (detail). 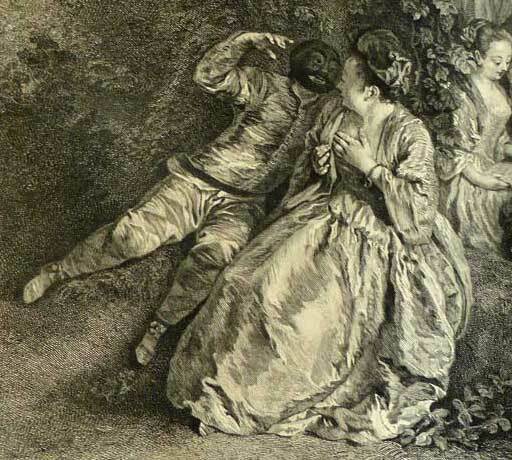 Nicolas Henri Tardieu after Watteau, Assis auprès de toy (detail), engraving. 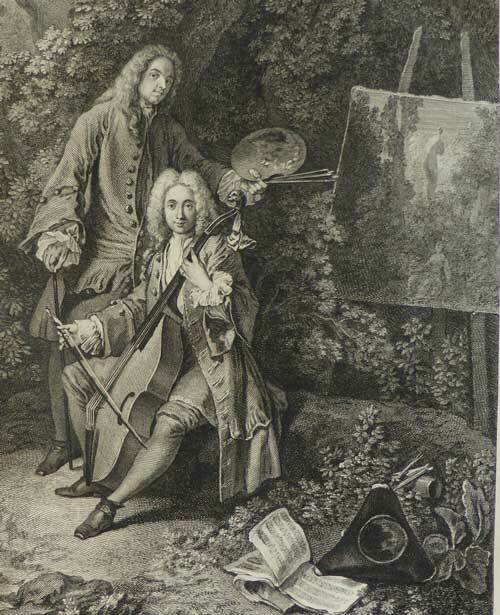 The figures at the far left, a seated cellist and a painter standing at his easel, are derived from Tardieu’s engraving after Assis auprès de toy, where the two men represent Jean de Jullienne and Watteau. Henri Simon Thomassin after Watteau, Voulez-vous triompher des belles? (detail). 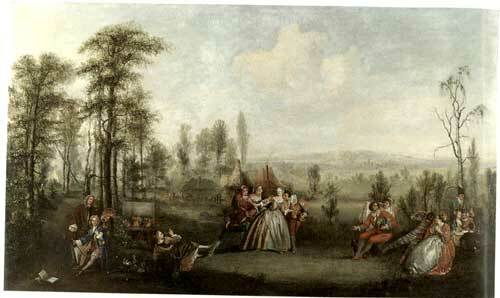 So too, several figures at the far right of this pastiche are recognizable borrowings from Watteau. The Harlequin menacing his female companion and the characters behind them are all taken from Thomassin’s engraving after Watteau’s Voulez-vous triompher des belles? The original painting, now in the Wallace Collection, is in the opposite sense. Anonymous artist, Blind Man's Buff (detail). Jean-Baptiste Pater, A Game of Blind Man’s Buff (detail), oil on canvas. London, Wallace Collection. This unidentified pasticheur was equally open to the inventions of Pater. The central group of several women and a man playing bind man’s buff, and the woman fallen on the ground are derived from Pater’s A Game of Blind Man’s Buff. As well, the bagpiper at the right, who gesticulates as though he is speaking to the woman immediately behind him, come from the same Pater composition. But the pasticheur, as is often the case, did not harvest these elements from Pater’s painting, now in the Wallace Collection. As the reversed directions of the figures indicates, he turned to Pierre Filloeul’s engraving after Pater’s picture. 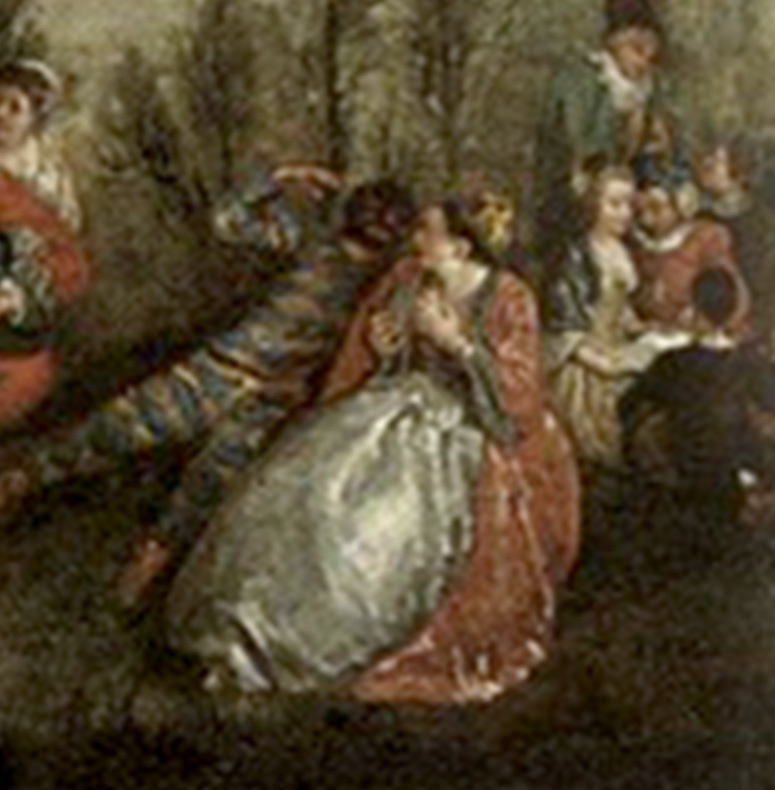 The unusually long, horizontal format of this pastiche and its landscape setting of straggly trees, as well as the inorganic way in which the disparate elements from different paintings by Watteau and Pater have been assembled are all at odds with most French fête copies and pastiches. One might wonder if this painting could be English in origin, from the late eighteenth or early nineteenth century.